The first race of the day at historic Detweiller Park was met with extremely high expectations for fans, athletes, and coaches. On paper, it appeared as though #1 Tolono (Unity) was guaranteed a virtual lock on the team title before the starting gun even sparked off. However, #2 Eureka had other plans and was ready to upset the balance of power. Many in attendance did not give the Hornets a stinging chance of beating the defending champions. Eureka senior star Emma Argo knew she and her teammates could get the job done. Argo did her part by winning her second consecutive individual crown in a personal best 16:59. Her teammates led by sophomore Alexi Fogo and senior Tessa Wiegand came through big with key front-running prowess. 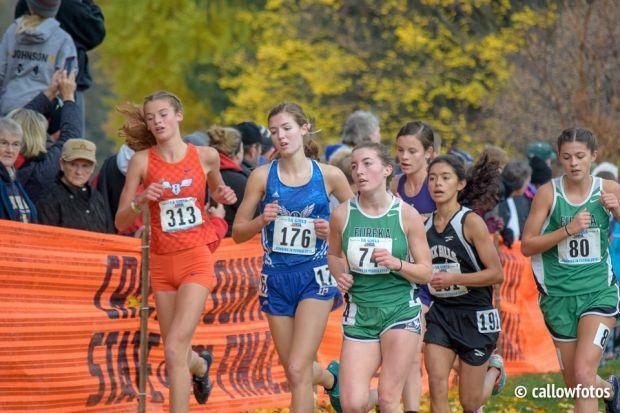 They, in turn, were rewarded with all-state honors in 14th and 24th place respectively. The fourth runner Lexi Grober finished 19th in the team standings, which was clutch, but the fifth runner is the most important person on the team. Freshman Elle Knapp closed out the scoring with a 46th place mark in the books. It was the first team title for Eureka who has a rich distance history led by head coach Olivia (Klaus) Morris. Morris was an outstanding runner for her beloved Hornets more than a decade ago. Now she is in the driver's seat of a program that will see more success in the years that come. #5 Rock Falls was also able to get by the Rockets with a great leading effort by junior Bailee Fortney who placed 12th overall (3rd/team standings). But having all five runners in the top 40 (including two in the top 30) was clutch in securing the runner-up trophy. Unity had to be disappointed in not defending their state title. They appeared to be rolling right all season and after dominating the Decatur (St. Teresa) Sectional), everyone was ready to airdrop the Rockets the first place trophy. Sometimes the eye test does not lie and from the very beginning, it appeared the Maroon like colors were spread too far apart. Unity did not run their best race and when that happens at the state meet, you can get beat. Argo as mentioned previously won the individual title comfortably over a tough foe sophomore Lydia Roller of Staunton. Argo and Roller traded blows for about 1.75 miles before Argo pulled away for good. Roller clocked a personal best 17:16 to hold off Amelia Mclain of Benton who also ran a personal best 17:26. Liberty's Katelyn Robbins returned from an injury-riddled junior year to close out a tremendous senior season to take third fourth in 17:29. Sophomore Karlie Hey of Sterling (Newman Catholic) closed out the top five with a time of 17:29. This was the fastest ever class field in terms of times as it took 18:15 to make the medal stand. Overall, 67 girls broke the 19:00 threshold.